Grilling during the lazy, hazy days of summer allows you to experience the creative, social and health benefits of cooking outside. Expand your joy of the grilling experience by creating an outdoor kitchen at your home with all the conveniences that you enjoy inside. Fresh air and sunlight will be a bonus and a welcome change from being inside. 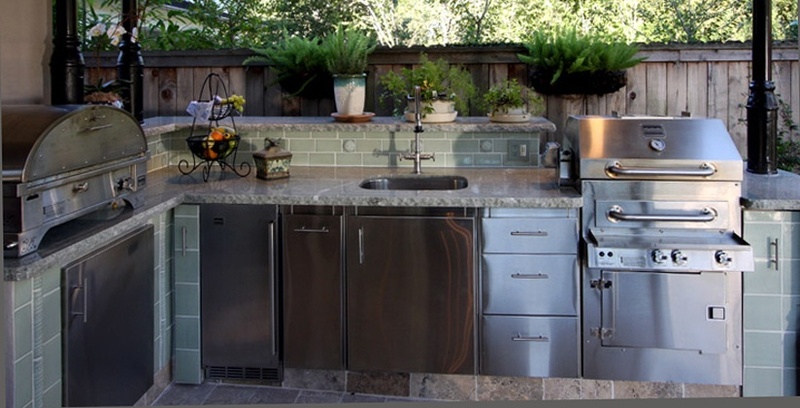 As you consider an outdoor kitchen, think through what you will use it for, and how you use it. Any enthusiastic cook would want the same convenience outside that he has in his kitchen by transforming his backyard grill into a fully-equipped outdoor cooking center. You would probably agree. Mingle with family and friends, and reduce the wear and tear that your guests have on your home by centering both your cooking activities and their social activities outside. From food prep to cleanup; you can do it all outside. Why miss out on cocktail hour while washing and cutting all the ingredients for a shish-kabob inside the house and then transporting them outside? Take care of the entire food prep process outside by including a generous sink and a cutting board in your outdoor kitchen. A Kegerator is a good option for beer! It’s always more fun to wash the dishes outside at that oversized sink. Plus your guests are more likely to pitch in. Consider a dishwasher. Not all brands are rated for outdoors, but we have seen them successfully used under cover. You can also individualize your cooking with side burners, making sauces or steamed vegetables a possibility. Consider a warming drawer that will help keep the food hot on the spot until you're ready to serve. Or for guests that arrive a little late. Alternately a simple electric buffet table will suffice. Be sure to include a refrigerator for sodas, juices and other beverages. Refrigerator drawers are nice for vegetables and condiments. Be sure that there is adequate storage for the pots and pans you will be using outside, from the clam steamer to the turkey fryer, as well as for plates, glasses and silverware. Just because you’re in New England doesn’t mean the outdoor cooking season needs to come to a premature end. The grilling season can be extended with the addition of extra heat. To warm up a small area, propane heaters will do the job. Fireplaces and hearths are perhaps the most attractive efficient way add large amounts of heat to larger outdoor entertaining areas. Consider an outdoor firepit area complete with seating. Shade from pergolas and awnings can make a big difference in your enjoyment of the space. An awning works in a pinch for late afternoon thunder showers that roll through unexpectedly. Awnings can be motorized and controlled automatically with a wind sensor. Some models are even cantilevered so that you don't need a pole right in the middle of your space. Appropriate rain shelters for the outdoor kitchen can help keep the cook and guests dry and comfortable. And don't forget the music - be sure that music and other entertainment are incorporated into the design of your outdoor space, making your grilling area the center of the party. Give us a call if we can help you think through what you might want to add to your home's outdoor enjoyment!